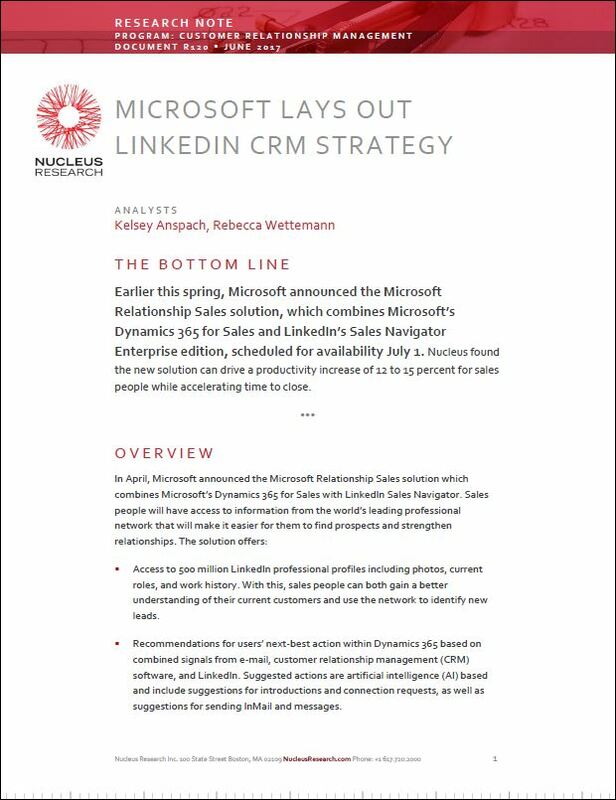 Microsoft Relationship Sales is the most complete sales solution from Microsoft, combining Dynamics 365 for Sales with LinkedIn Sales Navigator to give sellers access to the world's largest professional network, simplify prospecting and strengthen relationships. This Nucleus Research report provides independent analysis of the benefits of Microsoft Relationship Sales. Access to more than 500 million LinkedIn professional profiles including photos, current roles and work history. Recommendations for users' next-best action within Dynamics 365 based on combined signals from email, CRM and LinkedIn. Notifications on buyer relationship health including upcoming meetings, how many emails have been exchanged, their level of engagement, and identifies email messages that may be waiting for your reply. Notifications on updates such as news mentions and job changes. This allows users to tailor the conversation for each specific buyer in real-time throughout the account lifecycle.